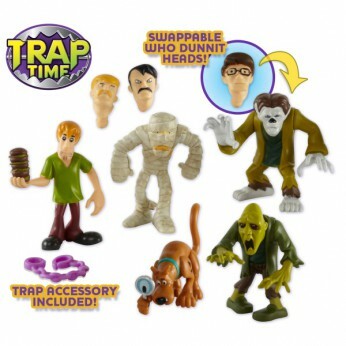 Includes 2 Scooby-Doo gang figures and 3 WHODUNNIT villains with interchangeable heads, plus trap element! Solve the WHODUNNIT mystery! Swap the heads on the figures and reveal the villain! Styles may vary…. This toy costs approximately £11.99 (for the latest and best prices make sure you check our retailer list for the Scooby Doo 5 Figure Pack above). In our review of Scooby Doo 5 Figure Pack we classed it as being suitable for ages 3 years, 4 years, 5 years but recommend you check the manufacturer specific advice before purchasing.